You can now play the chosen! This mod is in early alpha stages... Lots more content to come but im finding bug testing to be difficult since i am having to work irl alot and dont have much time to test. If you like my modding then consider donating to me. It can help give me some motivation to continue. So you can build them in the proving grounds after you defeat them in their respective fortress missions. But for the purpose of testing you can purchase them for 1 supply in the proving grounds. Abilities are subject to change.. Feedback on new and existing abilities are welcome. -As of yet the voice lines are tied to the animations. So playing this in zip mode will create some problems with overlap i would imagine. -I have not yet animated the chosen to use grenades/utility items.. So i disabled the utility slot for now. 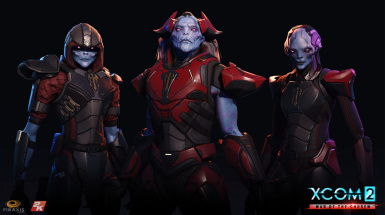 This mod uses user 190's voice edits he done for the chosen. So credit for the edits go to him.